The typical investment for a Bach to Rock franchise is $291,850 – $504,500. How long does it take to open a Bach to Rock? It can take four to six months after signing a lease to open a Bach to Rock school. How is Bach to Rock different from other music instruction? 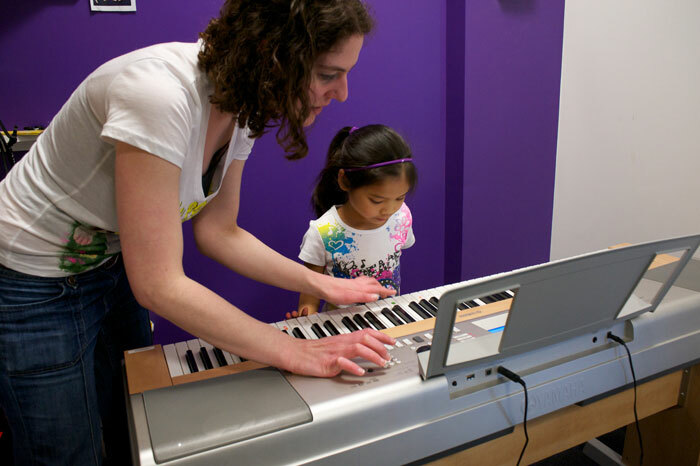 We believe music instruction should be fun. We also encourage students to learn to play the music they love. We rely on performance-based instruction, putting our students in groups and ensembles and scheduling them to play at public concerts in their communities. Our proprietary curriculum engages kids immediately and keeps them interested long after they would have given up on traditional lessons. We are seeking someone with a minimum net worth of $500,000 and at least $100,000 in liquid capital. Does Bach to Rock have a system in place to support franchise financing? Involvement in music positively affects everything from neurological development to social behavior and academic achievement. Numerous studies have shown it deeply enriches many aspects of children’s lives. We create geographically exclusive territories for our franchisees, so there’s never a worry about competing with other Bach to Rock franchisees in your area. A typical territory consists of at least 5,000 households with an average family income of $75,000 or more. What kind of location is best for Bach to Rock? We market to moms more than anyone else, so the best locations for our schools are places where moms are going to go anyway. Suburban strip malls anchored by big-box retailers are ideal. Typically, Bach to Rock franchises start out with one full-time music director and probably four to six part-time music teachers for a school with 250 students. With an enrollment of 500 students, you would probably add a full-time assistant director and have as many as 25 part-time music teachers, each working about 30 hours a week. Employees are scaled according to enrollment. We rely heavily on grassroots marketing, making sure we get in front of moms — our target customer — by scheduling performances at family-friendly events and by conducting paid and organic search campaigns. Our emphasis on local networking means your franchise’s marketing costs will be lower. After filling out the form (located in the sidebar of our franchise website) a member of our franchise development staff will be in touch with you quickly for an initial conversation. If you both wish to proceed, you can request a copy of our FDD at that time. Middle- to upper-income families with school-aged children living in suburbs close to large metropolitan areas. Where does Bach to Rock want to expand? We have schools on both coasts, and we hope to build 500 of them across the country outside major metropolitan areas like Philadelphia, Chicago, Boston, Dallas, Houston, Atlanta, Phoenix and so on. Do I need any musical experience? No. What we’re really looking for is someone with a passion for music and the arts, as well as for educating children. You’ll be hiring professional musicians to do the teaching, so your business experience is far more important than any experience you might have as a musician. Absolutely. Although we are open to owner/operators, the majority of our franchisees are investors who have hired someone to run their schools for them. To learn more about Bach to Rock, please click the button below.